A new cult is bringing a taste of ayahuasca to Montreal's night life, as it's members seeks recruits among clubbers and party goers. "Ayahuasca opens new ways of living to those who embrace it's manifold ways," says Danah Jinesh, an acolyte of the Golden Order of Yage. "It can solve humanity's problems if only people would stop and listen to it's wisdom." Danah spends her Friday nights cruising through the city's bars, looking for lost souls in need of divine revelation. "People turn to dance parties, to raving, to club going, out of a sense of desolation and desperation," says Danah. "People who are at peace with themselves feel no need for such vain, earthly pleasures. It is a sign of incompletion, of a hollow existence, that pushes people into the revelry of the night. We offer the lost souls thrashing on dance floors in this city a chance of completion, of salvation. An escape from the tawdry and deleterious temptations of the flesh." Salvation, according to the Order of Yage, comes in the form of a potent, psychoactive brew made out of the banisteriopsis caapi vine. Once ingested, enlightenment follows. "All problems can be solved with ayahuasca," claims Noah Balthier, a long time acolyte of the order. "Broke up with your girlfriend? Take ayahuasca. Lost your job? Take ayahuasca. Favorite character from Game of Thrones died? Take ayahuasca. Nothing, and I do mean nothing, can't be fixed with ayahuasca." Noah is so certain of ayahuasca's ameliorative effect, that he routinely gives the substance out to friends and family. "Even if you're not part of the order, your life can't help but be improved by consuming a bit of caapi." Ravers and party goers, for their part, are slowly opening up the order. "I thought they were creepy at first," says Renata Gagnon, "but it's hard to be creeped out by people who keep giving you free drugs. You can't really go out to a party anymore without someone offering you ayahuasca. It's great"
City police are less enthusiastic about the cult's operations. "Ayahuasca is a controlled substance," says Sgt. Lemieux, "and party goers should be aware that it is illegal to consume the drug. 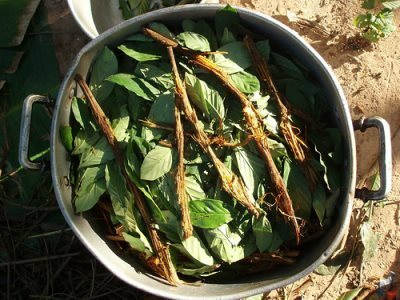 It doesn't matter if it's free, and while certain religious exemptions do exist for some drugs in Canada, there is no such exemption for ayahuasca." Danah and Noah aren't worried about getting arrested. "If the cops came for us," says Noah, "we'd just offer them some of our ayahuasca and everything would sort itself out. There's nothing ayahuasca can't solve. Ran over your neighbour's dog? Take ayahuasca. Took an arrow to the knee? Take ayahuasca. Got arrested for taking ayahuasca? Take more ayahuasca. It's god's elixir."